The year is 1987, the place is Palo Alto and this is Bill Joy, Andy Bechtolsheim, Scott McNealy, and Vinod Khosla — the co-founders of Sun Microsystems. If you haven’t guessed it already, these guys have made it big. Twenty-three years before their struggling company got picked up by Oracle, Sun’s founders displayed an eclectic taste in fancy automobiles, all equipped with retractable headlights. On the far left is Bill “why the future doesn’t need us” Joy, rocking a Ferrari 308 Mondial, which is mostly concealed by Andy Bechtolsheim’s silver Porsche 944. 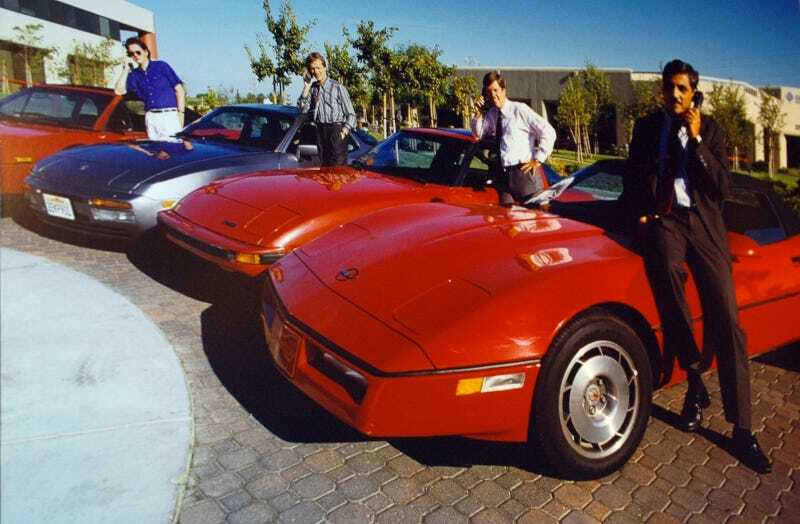 Moving down the pecking order of exotica is rotary-happy Scott McNealy with his Mazda RX–7, and brown-suited Vinod Khosla, who dominates this scene of American success with his very American fourth-generation Corvette. The philosophical implications of the entire composition are fascinating but unfortunately beyond the scope of this post. Still, nice phones, eh?